Another Nabi glitter polish today. 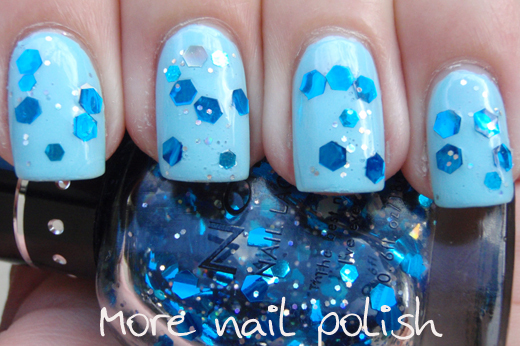 This is Nabi Blue Big Ball, one coat over Ulta3 Spring Shower. I love the final look, but this glitter was a beeoch to apply. I literally had to place each large piece of glitter on the nail. I couldn't wipe down the nail at all cause all the large pieces of glitter would just wipe off. This polish has large blue hex pieces and large silver holographic hex pieces, but I only managed to get one silver piece on one nail! 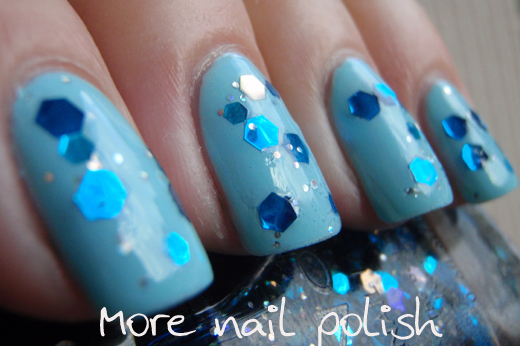 There are also slightly smaller lighter blue hex piece and then small silver and blue holographic glitter. Despite the difficulties I had applying this polish, the clear base in this polish dries quite dense, which means the glitter stays nicely beneath a glossy top and the result is a smooth nail. It really surprised me. The glitters in this polish are awesome. What I love most about them is the size of the large hexes. I have heaps of glitter polishes, but most are just small and micro glitters. It's a shame this was so tricky to apply. But really who cares if it's a little hard to put on when the results are so pretty. Oh yeah, can cause it was so tricky to apply, I ended up with bubbles, and lots of them, the tips of my nails looked like fizzy soft drinks. But, cause of the density of the polish, even the bubbles stayed beneath the finished layer. I used the foil method to remove this, and it almost came off smoothly. 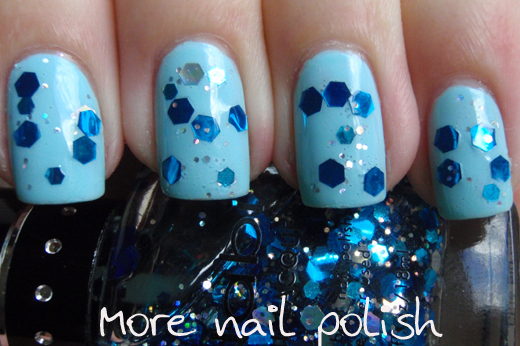 Just some of those large blue hexes stayed stubbornly on my nail and had to be scratched off. I'm going to go pick out another Nabi glitter to wear tomorrow, I just need to decided if it will be a green one or the red and gold one. 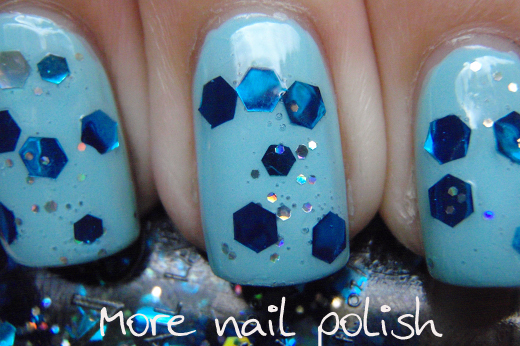 I've tried ending scraping off large hexagons like that too! But it's totally worth it, - I think it looks stunning! I love it! Hex glitter is so spectacular! Such a cute combo! Very simple and pretty! Love it! Cute! I love how big the glitter is! Nice! The pain of application was def worth it - looks fantastic!